TAUNTON, Mass. – Cassi Ronan picked up the ball inside the 30-yard-line and pushed the ball forward. She weaved her way past a pair of defenders and then touched it past a third to get clear on goal. The Walpole defender eventually caught up to Ronan, but not before she carried the ball nearly 70 yards. The defender managed to slow her down but a foul was called, giving the Franklin senior a penalty stroke. She buried the shot, giving the goalie no chance and giving the Panthers a 3-1 lead over the No. 1 seed with just nine minutes remaining in Thursday night’s Div. 1 South semifinal at Taunton’s Tiger Aleixo Stadium. It seemed like the Panthers, seeded 13th in the tournament, were finally going to end Walpole’s dominance in the rivalry and do it on the biggest stage. But, instead, the goal seemed to wake the Porkers up and they came storming back into the game. Walpole scored twice in the closing minutes, including a goal with just two minutes left, to force overtime and then added a game-winner eight minutes later to stun Franklin 4-3 and advance to the South final. 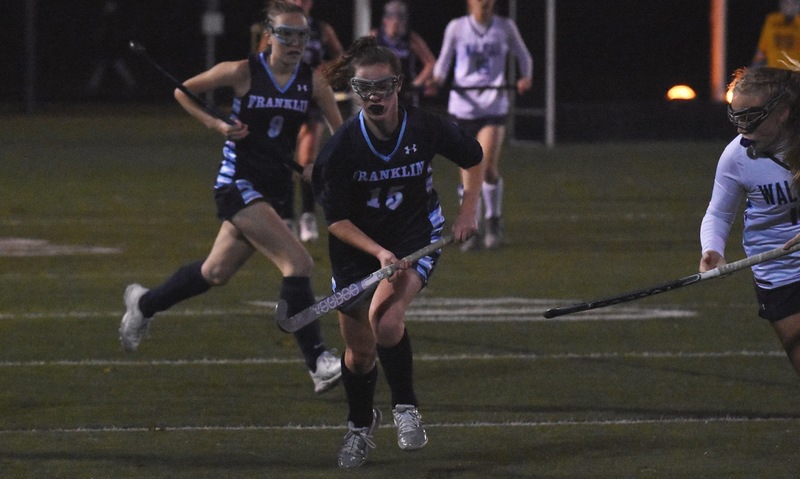 Franklin has struggled in recent years against the Porkers, who are a perennial state title contender, but the Panthers weren’t intimidated and played at least an even game through the opening 50 minutes. The Porkers jumped in front after just three minutes. Christina Luccini (18 saves) stopped the first shot by Molly Weiand, but Emery Murphy was on hand to tap in the rebound. Rather than let their heads drop, the Panthers answered back just five minutes later when Victoria Quinn redirected a shot by Ashley Reutlinger after a quick restart. Franklin nearly took the lead right away when Regan Paterson got loose behind the Walpole defense, but her shot was saved. A minute later, Paterson pressured the Walpole goal and had a clearance rebound off her and just wide of the post. In the 18th minute, Quinn and Amanda Lewandowski battled to keep the ball in the attacking zone and it opened up a chance for Quinn but she was unable to put it on frame. A minute later, she had her second of the night by being the first to react on a loose ball in the middle of the crease. Walpole nearly tied it right after halftime with a quick move from a corner but Luccini came up with a sliding save to keep it out. 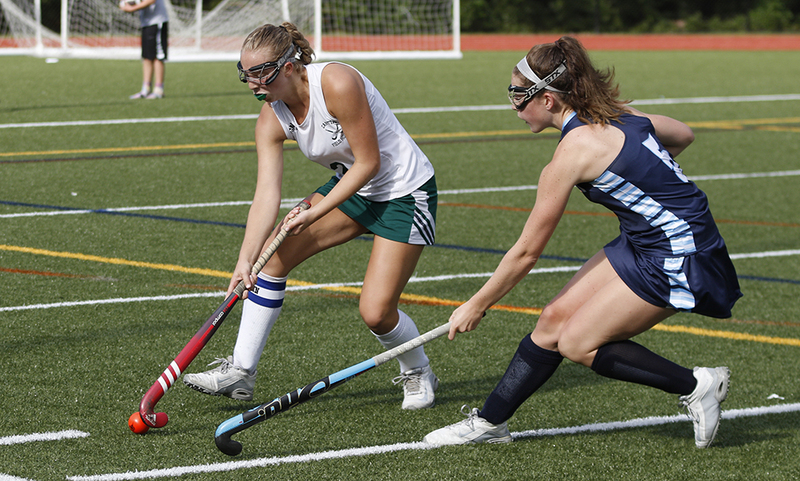 Maeve Ledwith showed off her game awareness shortly after when she got behind Luccini and cleared a goal-bound shot off the line. The Panthers nearly doubled the lead with 10 minutes to go. Quinn started the move down the left side with a pass to Paterson, who drove the ball all the way to the end line. She sent a ball towards goal that was tipped at the near post by Reutlinger, but only into the side of the goal. One minute later, Ronan got a head of steam and went on her amazing run to make it 3-1. The third goal seemed to wake Walpole up. The Porkers flipped a switch in the final 10 minutes to put Franklin back on its heels and open up chance after chance. Murphy got the comeback started with her second goal of the night, tipping in a corner to make it 3-2. Luccini was doing everything she could to keep the Panthers in front. She made a pair of saves to deny the Porkers and the rebound was knocked into the outside of the net by Jessica Tosone. With just two minutes remaining, Luccini came out to challenge on a pass through the middle, but Weiand got to the ball first and managed to pull it past the goalie and just inside the post for a tie game. In overtime, Luccini continued to be the hero for the Panthers, stopping both Audra Tosone and Brooke Skulski from close-range. “I called a timeout and tried to settle them down a little bit and it worked for a little bit but then I think the emotions just started to rise and we made a few little mistakes. I’m very, very proud of my team. Unfortunately for Franklin, Walpole looked like it had another gear while the Panthers were tiring. Off a corner, Caileen Quinn ripped a shot from straightaway, through a crowd, and into the back of the net for the win. It is the second straight year that Franklin (13-6-2) has been knocked out in overtime in the tournament. Last year, King Philip went on to win the South title, a feat that Walpole will look to replicate on Saturday afternoon.